We have two rooms available, one a generous 8-mat sized Japanese-style room (roughly 14 square metres/150 square feet), the other a Western-style room (roughly 14 square metres/150 square feet). 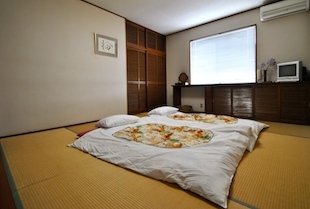 The Japanese-style room has tatami flooring, and bedding is traditional futons set on the floor. 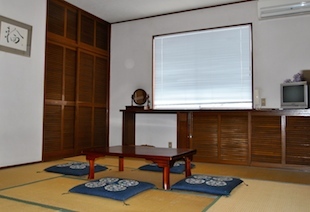 Guests are requested to remove their slippers and take care with luggage on the tatami flooring. The Western-style room has two single beds, with room for one folding bed (additional cost applies), a small sitting area, and a desk. Please note that the folding bed is set up where the sitting area usually is, and thus the sitting area has to be moved, and is greatly reduced in size. Both rooms are equipped with a small television, hairdryer, aircon unit (for heating and cooling), and wardrobe or closet for hanging clothes. Please note that rooms do not have ensuite washrooms or bathrooms. Washrooms are located down the hall from guest rooms, on the second floor, while bathrooms are located on the first floor. Bathrooms are Japanese-style, with a family-use bathtub and shower, as well as a changing area with sink and mirror. Room rates include breakfast, which is simple (for example, a croissant sandwich, with salad, orange juice and yogurt). There are convenience stores, restaurants and cafés in the area for snacks and other meals, though be advised that most shops (except for the convenience store) are not open late. 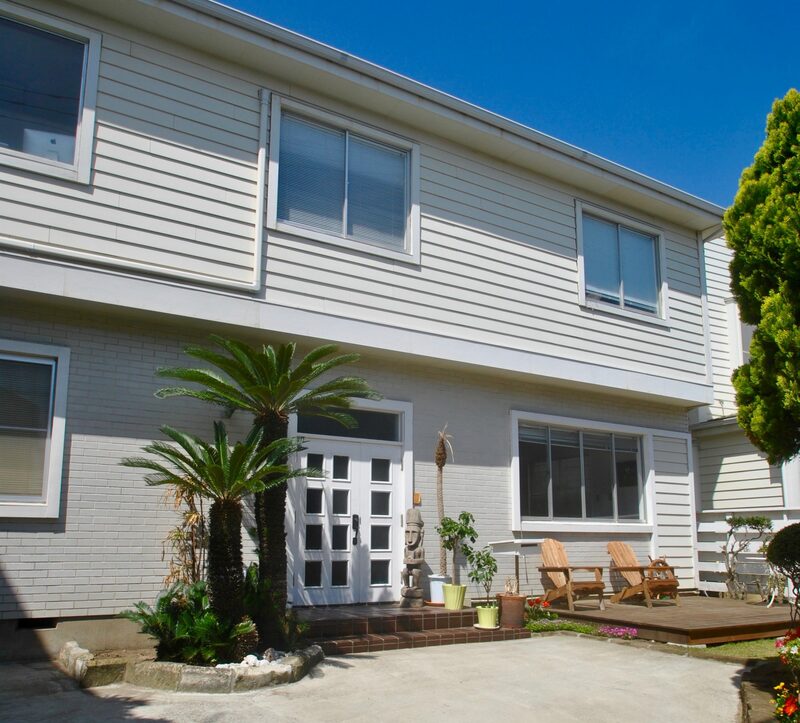 Rate: ¥6000-8000/person/night, depending on season and day. Prices for children vary. Please visit our Booking.com page for details. 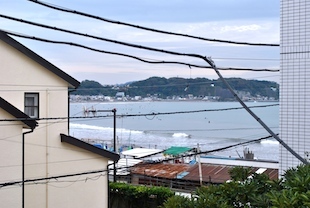 Rate: ¥7000-8000/person/night, depending on season and day. Prices for children vary. While at ryokans, futons are generally set up by staff, at Japanese pensions and guesthouses, guests set up their own futons. Everything you need is in the oshiire (closet). A light blue or patterned blue mat goes down first (this is optional), followed by a dark blue or brown one (if the futon is a thick one, there won’t be a thin mat). Next up is a white sheet—this is what you’ll sleep on, not under. 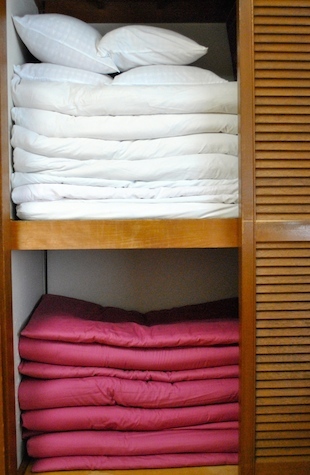 Last is the kakebuton (duvet). And then, of course, pillows. Rooms will also have towels for each guest. For the sake of the environment, please limit yourself to one set of towels per person for your stay (unless they’re damp, in which case just ask us for a new set). I love your blog2015 photos. We would love to stay from to March 11, 2015 for five weeks. Yeahhhh! Love MuM and beeee safe and xoxoxox to all. I’d like to stay from 24 to 25 on this Sep.
Is there any room left? Thank you for your inquiry. I’m afraid we’re closed for maintenance over that period, so we don’t have any rooms available. Sorry! I’d like to stay from 15 to 16 on Oct. Thank you for your inquiry. I’ve just had a look at our Rakuten and Booking.com availability, and unfortunately, we’re already fully booked that night. Many apologies.